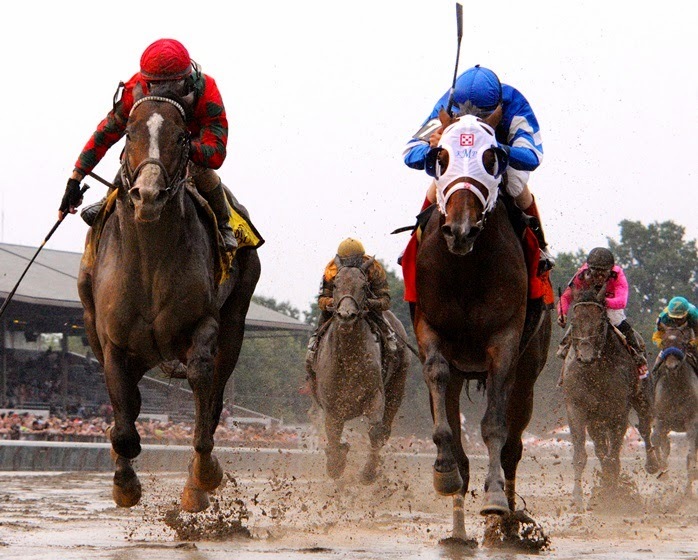 NYRA just mailed the applications for season seats for the 2014 Saratoga meet. Completed mine immediately, and now the countdown to the July 18th opening day becomes more intense. But while dreams of this year's 40 days of the best horses, the best... Well you know the mantra. Let's continue our reminiscences about last season. 4 Royal Delta in the Personal Ensign. Let move to the next 3 of the 2013 meet's best. 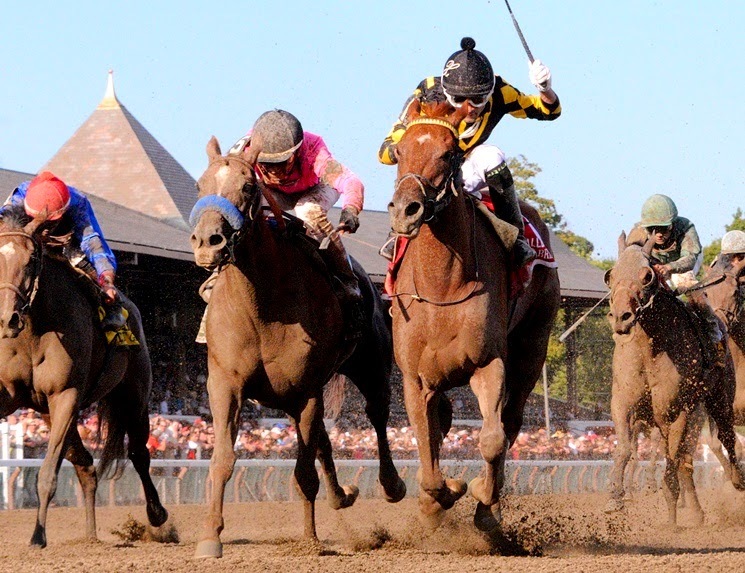 The Woodward is one of the premiere races run all year, at Saratoga or anywhere. In recent years, the Woodward produced some of the greatest races won by some of the greatest champions. Havre de Grace and Rachel Alexandra and Curlin and Lawyer Ron. And before them, there was Ghostzapper, Mineshaft, Lemon Drop Kid, Cigar, and Holy Bull among others. Well in 2013, the line-up included Flat Out, Successful Dan, Ron the Greek, Paynter, and the longshot at 8-1, Alpha. And what would you know? 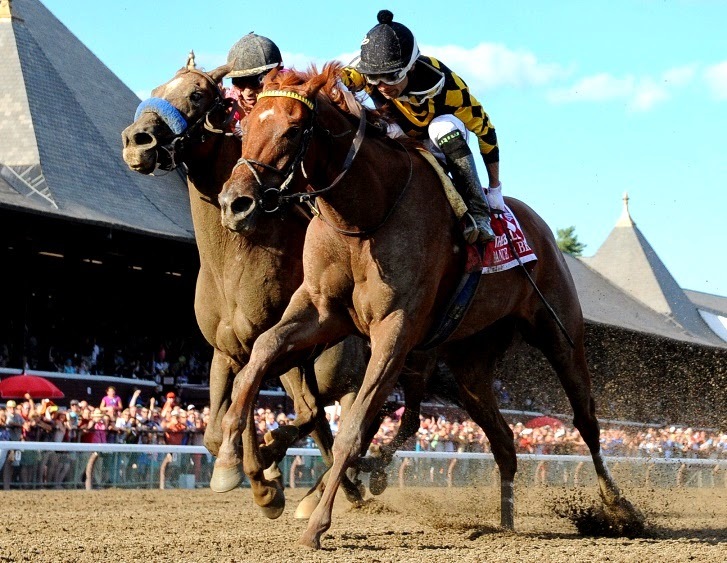 From the outside, Alpha was taken immediately to the front by Johnny V and he never gave up the lead. He was challenged early by Paynter and then in deep stretch by Flat Out. But he dug in and prevailed by a head. Alpha's last victory came at Saratoga in the previous year's Travers (in the dead heat with Golden Ticket), just a month after he had won the Jim Dandy. He had not won in the intervening 6 races, and he has failed in his 4 attempts since the Woodward. But the then-4 year old son of Bernardini was certainly the star on that last Saturday of the 2013 meet. She won 7 times in 2013. At Laurel, Charlestown, Pimlico, Belmont, and Saratoga--where she had won the Honorable Miss in July before the Ballerina in August. Dance to Bristol broke her maiden as a 2 year old, 2 years earlier at Laurel, her home track in Maryland. She eventually followed up with victories at Aqueduct, Charlestown and Pimlico. But it was in the Spring and Summer of 2013, her 4th year, that she really shone. 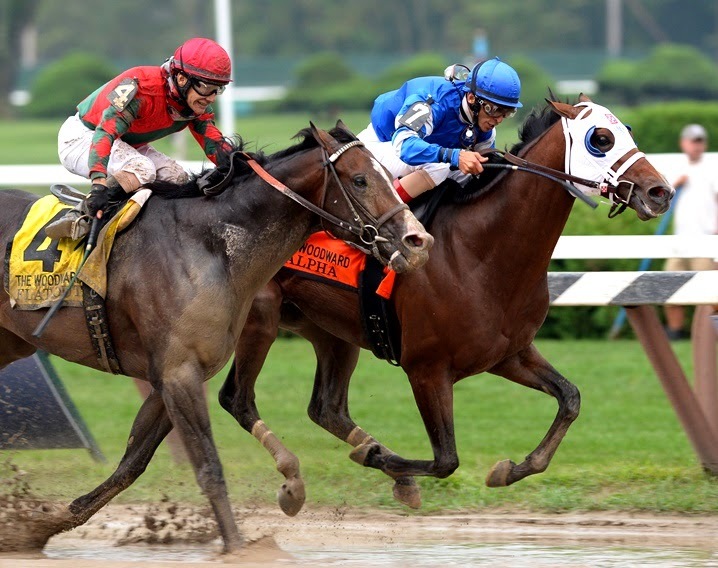 Challenging increasingly strong competition in 6 and 7 furlong stakes races, culminating in a grade 3 at Belmont (the Bed o' Roses) and the grades 2 and 1 at the Spa. In the 7 furlong Ballerina, in a field of 10, Dance to Bristol settled not far behind front running Classic Point. Under urging by Xavier Perez in the irons, she took the lead in mid-stretch. The favorite, Book Review, came closing fast from 7th. But Dance to Bristol refused to give up the lead. A thrilling, truly gallant effort. Much the same as her victory over that front-running Classic Point by a neck 4 weeks earlier in the Honorable Miss. Dance to Bristol was retired from racing in a celebration at Laurel in November. The daughter of Speightstown (meaning Secretariat's daughters Secrettame and Terligua on top) was set to be bred to War Front at her new home in Kentucky. He arrived on Travers Day with a 2 for 8 record. 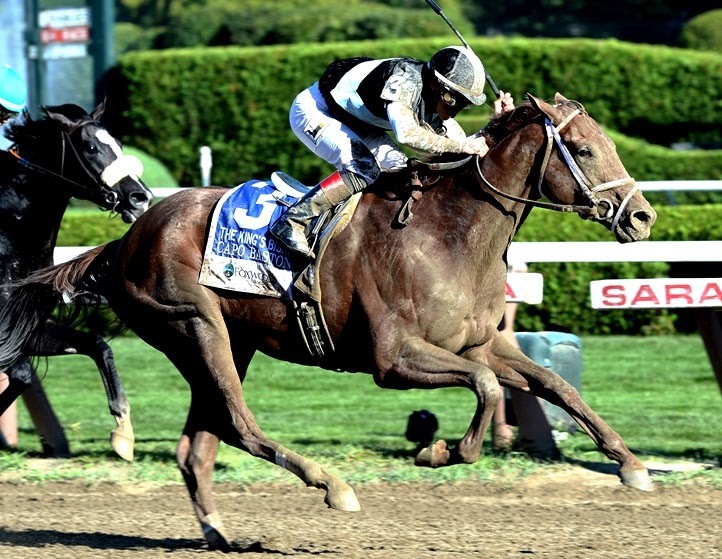 That included a 7th place finish in his previous race in the Woody Stephens at Belmont in June. Capo Bastone was nothing if not a disappointment for trainer Todd Pletcher--as well as for the several different jockeys who had been assigned to ride him. At odds of 28-1, he was not taken seriously in the 7 furlongs, grade 1, King's Bishop for 3 year olds. And for the first half of the race, he seemed to be proving the bettors correct. But then, into the stretch, Irad Ortiz took Capo Bastone 3 wide and, with a little urging, got the underachieving son of Street Boss through an opening in the 14 horse field. At that point, Capo Bastone put on a show of the talent he was thought to have. He barreled past all rivals, including leader Mentor Cane, and finished with a rapidly expanding 2 lengths ahead. The crowd was shocked by the winner and, even more so, by the way he simply roared past all the competition so that in the end it was no contest. 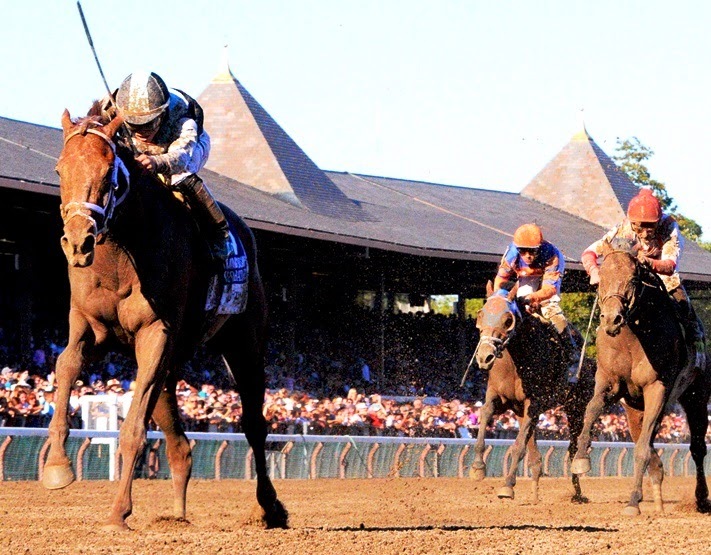 Surely, this was one of the most surprising and thrilling races of the 2013 Travers Day card. Well there they are: my #'s 5, 6, & 7. Great performances, great thrills, great memories. In the next installment, we'll round out the Top Ten--or Ten+.